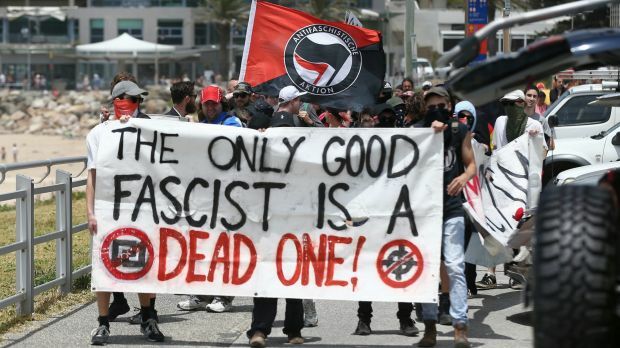 members of the anti-fascist Antifa group at a protest. Now where have I seen those colors on imagery before …? Threats from hard left protesters with the potential to use violence and extreme intimidatory tactics have caused local Israeli gym owner Avi Yemini to cancel a planned meeting with the Melbourne Jewish community and One Nation senators Pauline Hanson and Malcolm Roberts. The planned topic of the meeting was Islamic immigration and afterwards there was to be a question and answer session. Yemini encountered a number of obstacles in his bid to organise what should have been a simple community meeting between elected politicians and Australian citizens. His first problem was the local Glen Eira council administrators who refused him permission to use council properties to hold his meeting after stalling him along the way with vague assertions of double bookings and venues suddenly being unavailable. But Yemini’s greatest obstacle was the local Jewish community leaders themselves who seem to have somewhat of a tendency to lean towards the political left. The reason why I have a problem with the more extreme elements of the MGTOW movement is because as Vox Day says it is an evolutionary and civilizational dead end. As he observes, women are always going to congregate and come to the assumption that they are ‘oppressed’ no matter what their actual circumstance. It is our duty to fight against the more extreme elements of feminism so as to save young women who would otherwise be indoctrinated. This is not done out of great humanitarian love but rather as a more practical task seeing as it results in women who are much less objectionable than their feminist counterparts. And ultimately because in the end it is the desire of most men to start a family. It is all well and good to talk the big talk of going your own way early on but as the years go by and particularly if you meet a woman who gives you the stirrings of faint hope that she may be a worthwhile risk, then you may find that you want to change your tune. The murdering tyrant Castro is dead. Castro has died at the age of 90 and quite frankly I’m surprised that his brutal regime even admitted it. Although perhaps their prime motivation to cough up the corpse was the news that the Cuban government is instituting a special homage tax. Saturday morning, the organizing committee of the funeral will provide our people with detailed information on the organization of the posthumous Homage that will be taxed to the founder of the Cuban Revolution. So it seems old Castro needs some moolah to bribe his way into heaven. Who knew? Many people today do not understand how much of an asswipe this prick was. Sure it’s possible to trot out mountains of grim statistics that illustrate the pathetic levels of economic growth that the Cuban people have enjoyed for the past sixty odd years. And we can mention that measured as a percentage of the population Castro far outdid even monsters such as Stalin in persecuting, imprisoning, and executing his own people. Yesterday afternoon I met my wife in the city for an after work drink and dinner. I made the mistake of telling her to pick the bar as I was coming into the city and she was already there. My wife likes to people watch, particularly if it is a crowd that we do not normally associate with. I found the bar and immediately swore under my breath. It was your bog standard after work pick up joint for office workers. It had a jungle theme which is really all you need to know, although I will say that the startling profusion of fake oversize stuffed animal heads emerging from the walls was somewhat of a distraction. The good wife also likes rooftop bars and this one was about ten flights up on a rickety internal wooden staircase that screamed fire trap. Emerging into sunlight I stepped out onto the crowded wooden deck which was lined with plastic palm trees. The place was packed with lower tier office workers in suits and skirts. It was still very early in the evening so nobody was obviously off their face but the place was a meat market. It had the meat market vibe. The average age was probably around thirty five, the sort of age where desperation has caused peoples’ standards to drop to the single requirement that the other person uses deodorant.